Since the 1960's ANGULUS has worked with a shoe manufacturer in the village of St Joao de Madeira, 40 km south of Porto in Portugal. Manager José Tavares, third generation at the factory, oversees the creation of ANGULUS shoes with equal amounts of passion and professionalism. 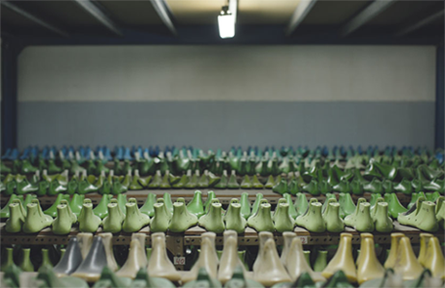 Each season, José and his employees manufacture thousands of beautiful shoes. Making a pair of ANGULUS shoes is a long, precise and rewarding process. From the first step of a shoe's creation till its finish, 48-60 steps are required and so many wonderful people have poured their expertise into the product. We are proud to be working with these awesome shoemakers, and think of them every time we wear or sell a pair of the shoes they made.